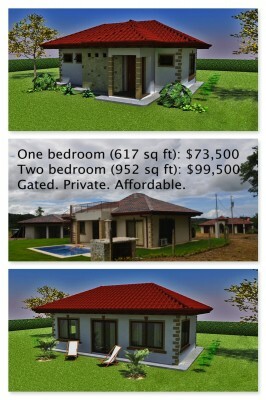 We can package almost any home on any lot and we offer “Home+Lot” packages starting at $75,000. This 617 square foot home can be started almost immediately. We handle all of the permits, construction process and provide you with weekly photos so you can track the progress of your home. The entire process is entirely turn-key. Request more information about this home or any other home by contacting us or fill out the form to the right of this page and request home designs. 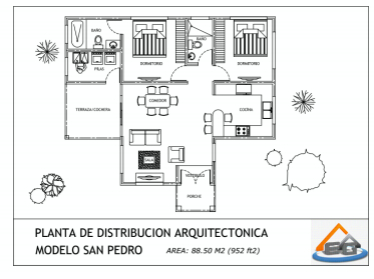 You will receive all the details, costs and options available here in Las Villas de San Buenas. This lot is part of our Herradura section which has sidewalks, rancho, curbs and gated entrance. The $99,500 version is a spacious 952 square feet. Perfect for a couple to own with enough space for privacy and use the second bedroom when guests are in town and as an office when they’re not. This home also has great rental potential. We handle all property management details – you build it (we provide turn-key EASY construction too!) and we’ll manage it. Add a pool and golf course membership and for only $125,000 you can have a beautiful two-bedroom home, a private swimming pool and a golf course membership to the only golf course in Osa, Costa Rica. We have a second home+lot option available for $72,500. This modern home design can be built on Lot #2, beginning almost immediately. The home+lot location near the entrance of the property make it a perfect home for active owners, families with young children (public school is just down the street 300 meters) or those looking to generate potential rental income. Renters always appreciate being able to easily arrive and leave from their rental home. 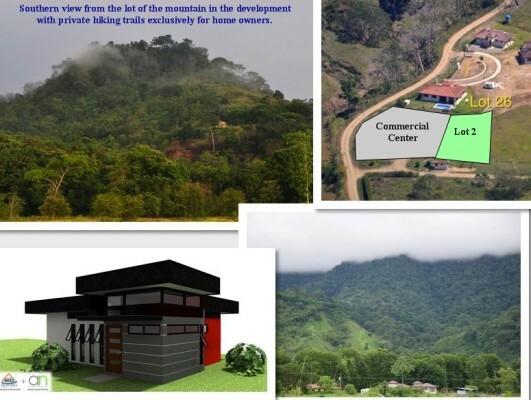 Owners of this lot will enjoy the southern views of the mountain that rests in Las Villas de San Buenas. A large portion of the mountain is protected due to its large trees, wildlife and slope. We have put in hiking trails that go to the top of the mountain and are only accessible to our owners. The views to the east are another set of green, lush, mountains.